LOAD UP TODAY. LIFT MORE TOMORROW. Load up today with this comprehensive formula so that you can lift more tomorrow. 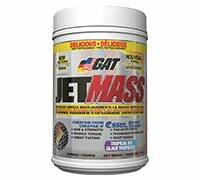 Clinically-effective German Creatine: JETMASS contains an unbelievable 6 different forms of creatine, including a clinically-effective dose of the most proven and bioavailable form studied to date, creatine monohydrate. GAT insists on using only German creatine monohydrate, produced using carefully selected raw materials under GMP conditions. Depending on dose, creatine supplementation can produce increases in mass of up to 4 lb or more within a week or less. Electrolyte-bonded phosphates: To support recovery of muscle cell membrane potential and ATP production. High-ORAC antioxidants including Capros®, a patented extract of Phyllanthus emblica with greater stability than Vitamin C and 17x the antioxidant power of pomegranate. Arginine & Citrulline: We combine 3 different forms of arginine with citruliine malate to help optimize nitric oxide production and support muscle energy metabolism. Waxy Maize: Gently raises blood glucose levels to help restore muscle glycogen. Great for those who “crash” with other carb sources. Also contains Cinnamon bark, Atlantic kelp, Alpha-GPC, CLA, L-Dopa and more! 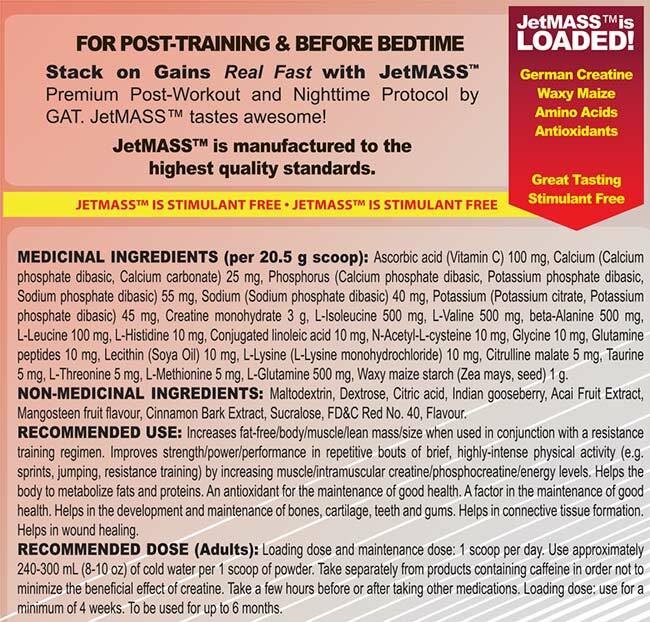 SUGGESTED USE: Immediately post-workout, mix 1-2 scoops of JETMASS with cold water and consume. For best results, consume JETMASS on a light or empty stomach.